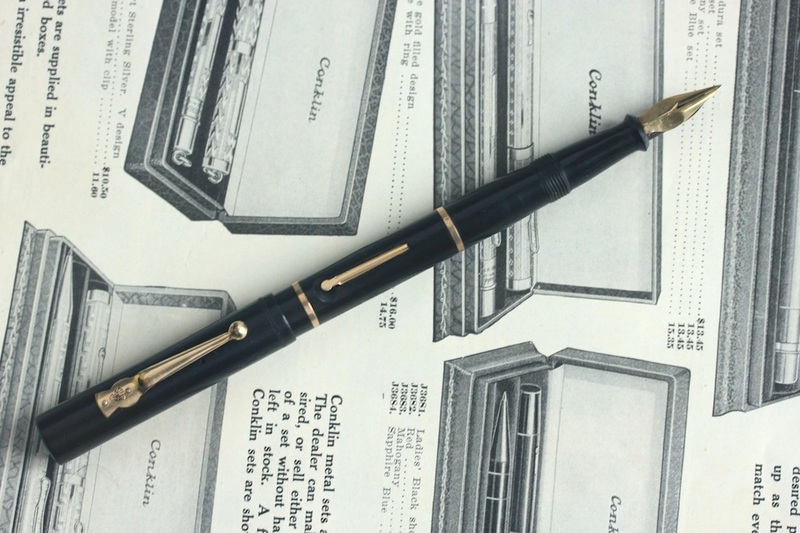 You will find in this section vintage fountain pens of many different brands. There is no specific classification (alpha, chronological, by country ...). 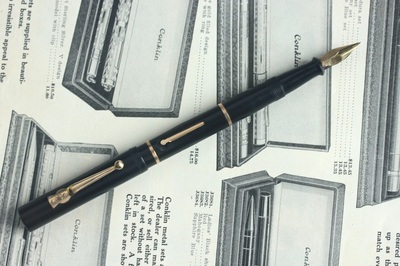 This fountain pen is a quite rare Eversharp Coronet. It was produced between 1936 and 1941 and has a very art deco design. It is mainly hard to find in nice condition, without ding or brassing. This one seems to have been gently used and is really nice. I really like this design even if i would have loved to see it in sterling silver ... but it doesn't exist. 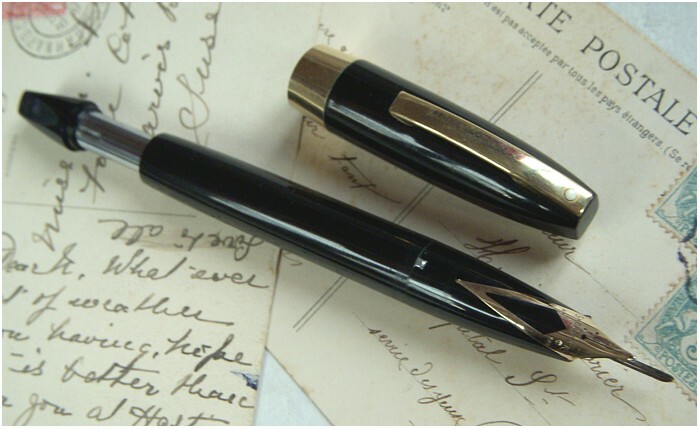 This Pelikan set is a very rare version of the Pelikan 100. Cap and turning knob are made of Red Hard Rubber as well as the pencil. According to ﻿The Penguin﻿ (Rick Propas website, a well known specialist of Pelikan), "These variants seem not to have been produced in large numbers and may have been marketed and sold mostly outside Germany." Indeed this set was found in France. 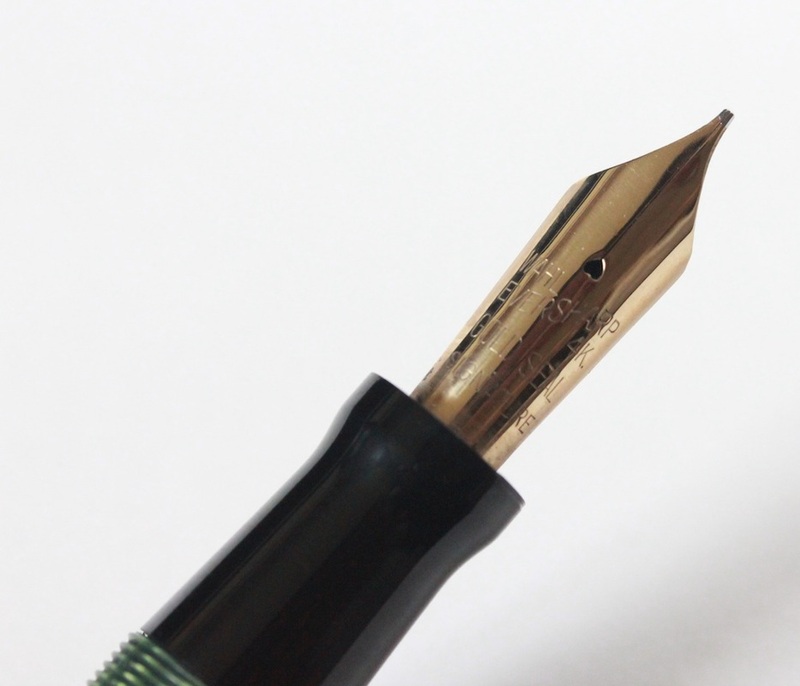 The fountain pen has a 18k Solid gold Pelikan nib. 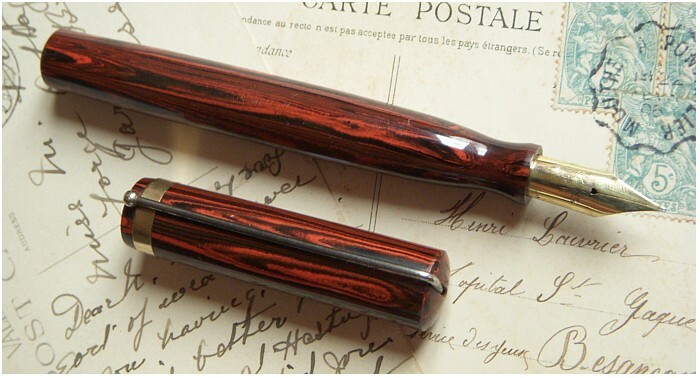 Recently, Pelikan produced a 101N Red and tortoise. Laughlin was an american brand from Detroit founded in 1896 and closed in 1926. 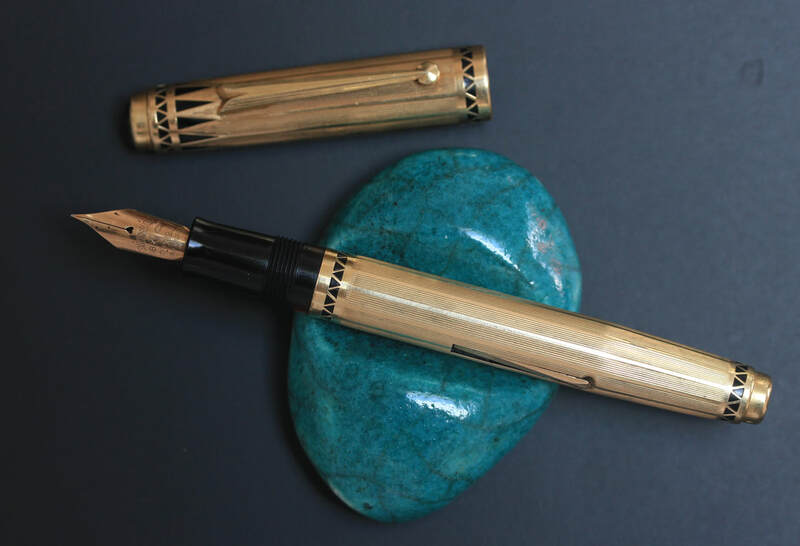 The manufacture made high quality eyedropper fountain pens and also produced a thumb filler. This pen is a beautiful example. Made of abalone and pearl with a gold plated filigree cap. It is quite thin and long, very elegant. 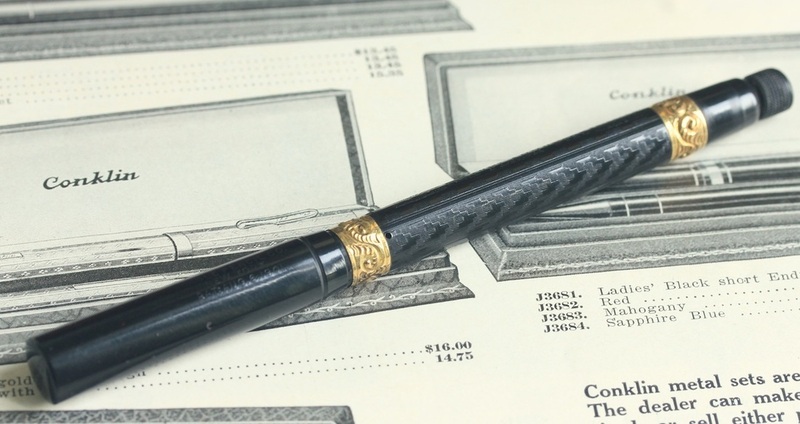 Most collectors are looking for specific brands, waterman, parker, sheaffer, montblanc, swan and others. 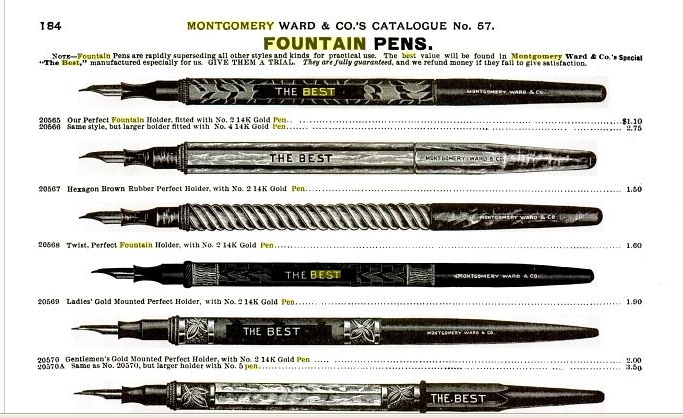 These famous brands made beautiful, rare, or more common pens. 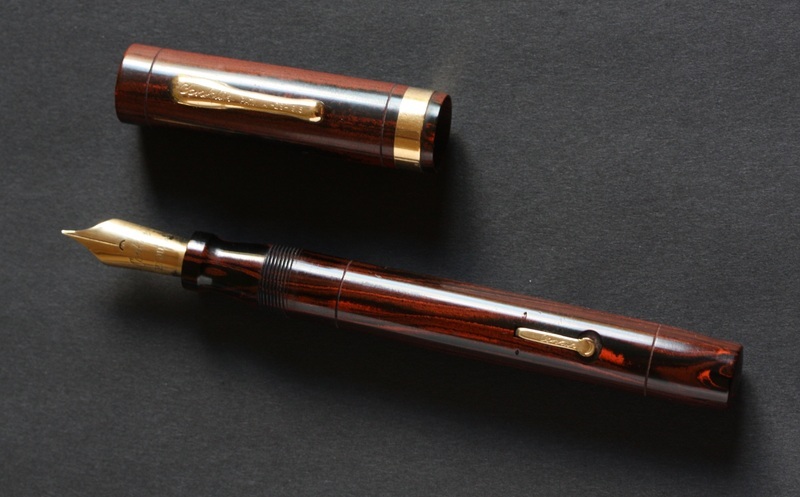 It is also interesting to look at smaller brands, less known, who made very nice and sometimes much beautiful pens (and which can be bought at lower prices ...). 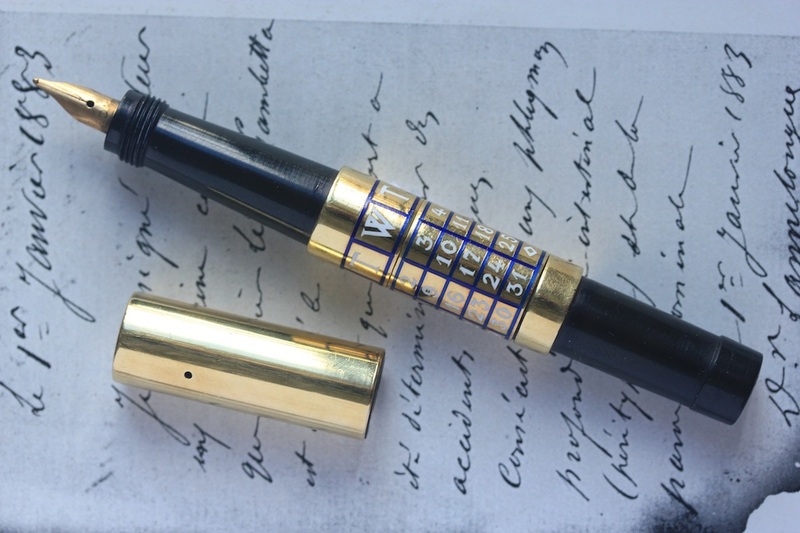 This little safety pen is one of these "no brand" with a nice 18k solid gold overlay and a perpetual calendar. 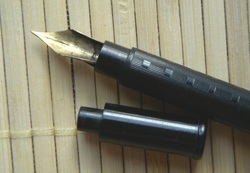 The nib is a "Soma", a small french pen, but there is no chance this pen was made by this brand. So who made it ? I don't know. 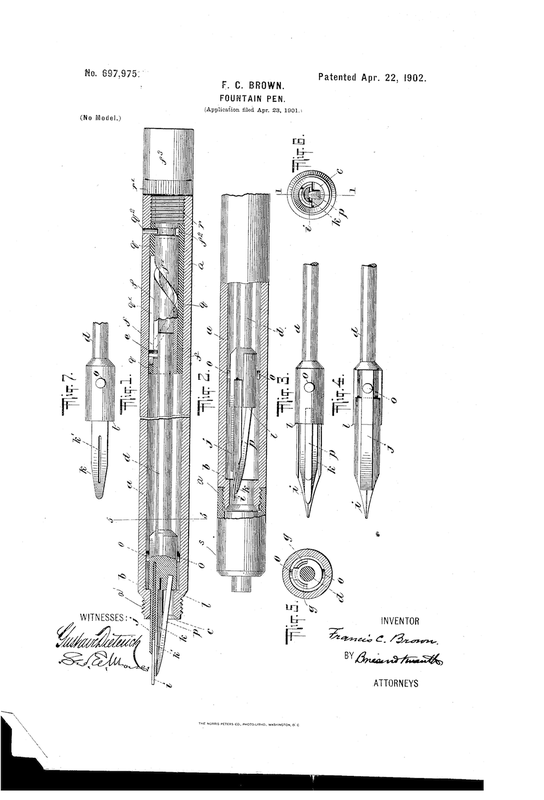 Maybe the same jeweler who made pens for Cartier as a very similar safety pen exists in the Cartier production (see the book "Un Amour de Stylo") but these pens were engraved "Cartier". The Calendar is in english (english days) so the pen was made for the english or american market. 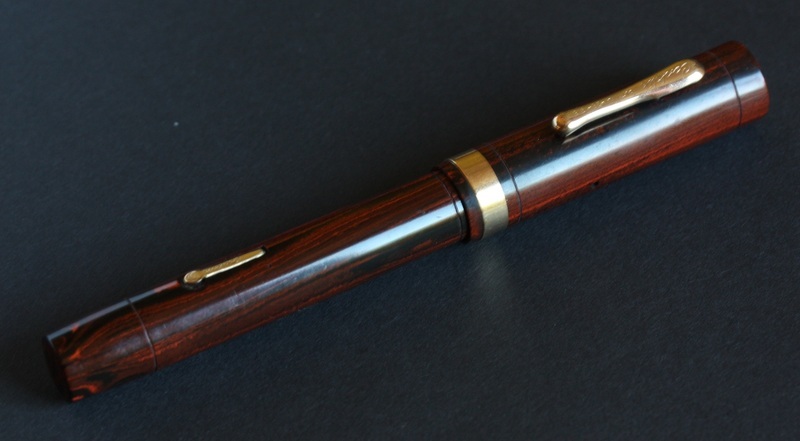 This is another example of a very interesting "no brand" pen. 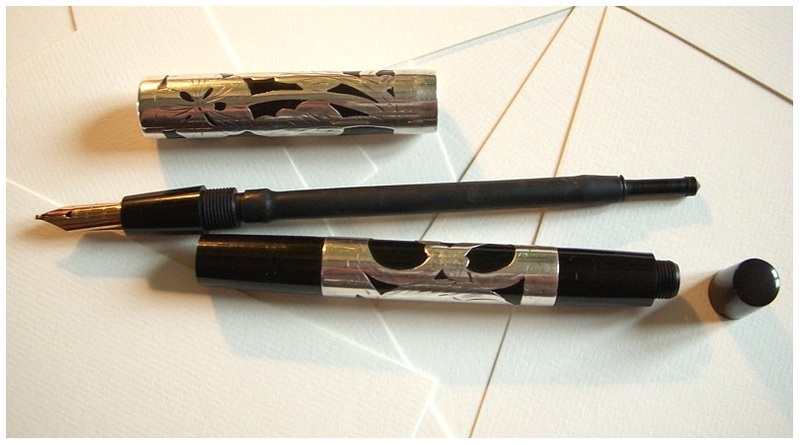 The work on the sterling silver overlay is beautiful, high quality, similar to some rare and very expensive Waterman. Definitely, it is possible to build a nice collection with small brands or no brands pens. 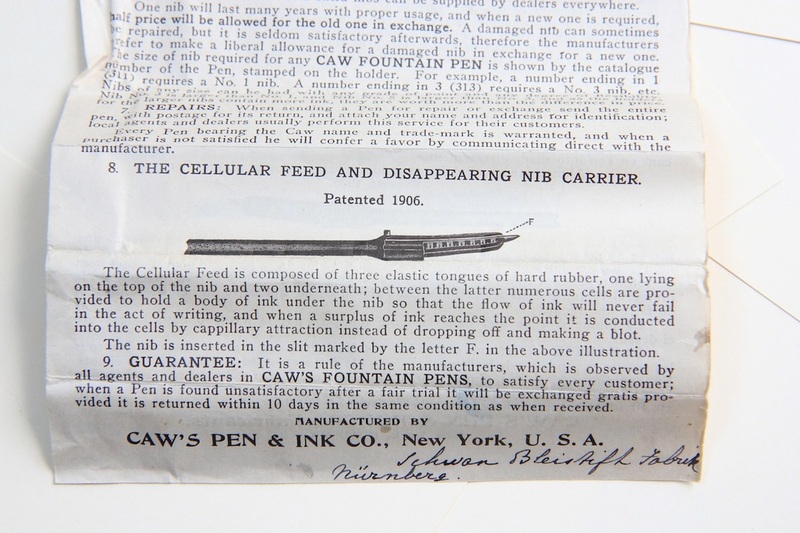 This is a very early fountain pen made by Caw's Pen & Ink Co. in New York. This company was created in New York by Francis Cashel Brown in 1895. This is a safety pen with a very simple design. 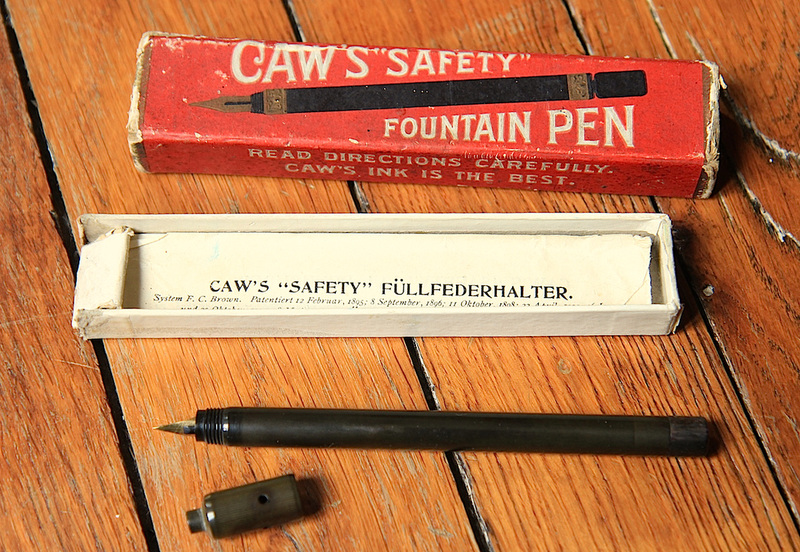 I had the chance to find this rare pen with box, instructions and still with its original Caw's nib. The system had to be restored when i took this first picture. Below, the same pen after restoration by Francis Goossens. Francis built a new axle as the original one was broken. The pen is now in perfect working condition. The nib is very fine, smooth and flexible. A real pleasure to use. It seems the pen, instructions and box do not match. 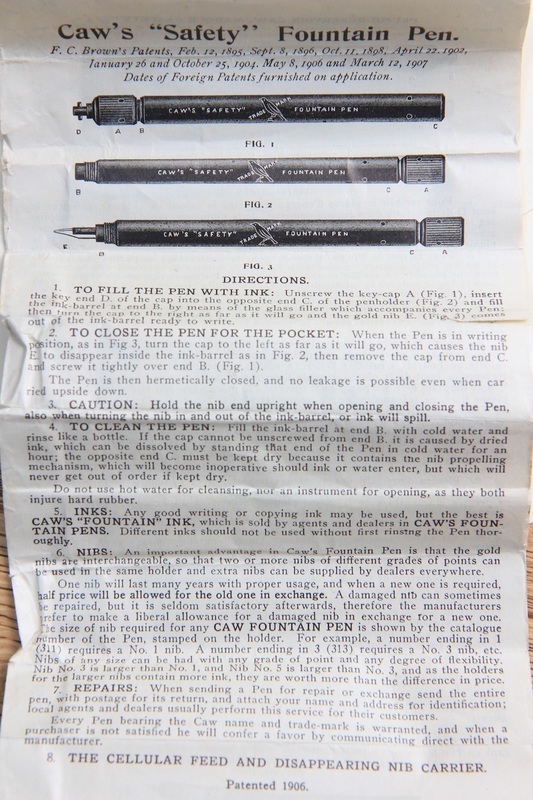 The pen was certainly sold in this box with these instructions as this pen is so rare and i don't think the seller, who was not a pen collector, found the box and the pen separately. However there is the number 311 written on the box and the pen is a 313. The instructions show a "key" on the cap. 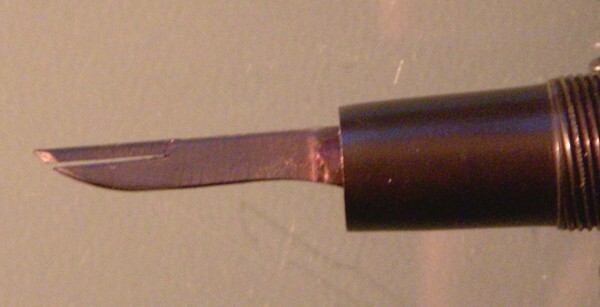 This key was used to activate the system at the back of the pen so the nib can go in and out. This fountain pen doesn't have and never had a key on the cap. This pen is made by EAGLE Pencil Co. in New York. To fill the pen, pull the button at the back of the pen. This pull down the bar which press on the rubber sac to evacuate the air. Then push the button, the bar goes up, the sac get back to its original position and the ink enter in the sac. The pen is in really nice condition for its age with crisp chasing and imprints. Another interesting Eagle made of painted metal. The filling system is a "Thumb filler". To fill the pen, turn the button at the back of the pen and the sac appears with a pressure bar that can be pressed with the thumb. 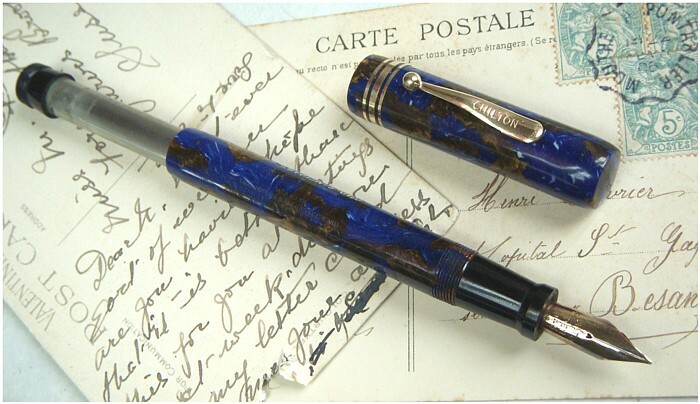 This system can be found on high quality fountain pens such as Aikin Lambert. Nib is engraved "Eagle Snap Shot N°49"
The clip is also signed "Eagle Pencil Co" and is patented July 20 1915. 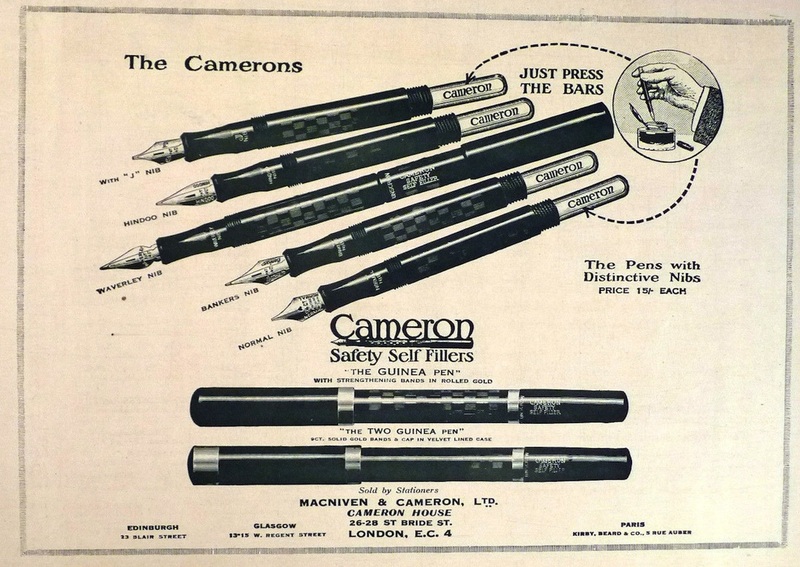 Macniven & Cameron is a pen maker from Great Britain. I haven't seen many pens of this brand. What i loved on this one is its beautiful Waverley nib N°4. "Waverley" nibs were usually made for dip pens (steel nibs). 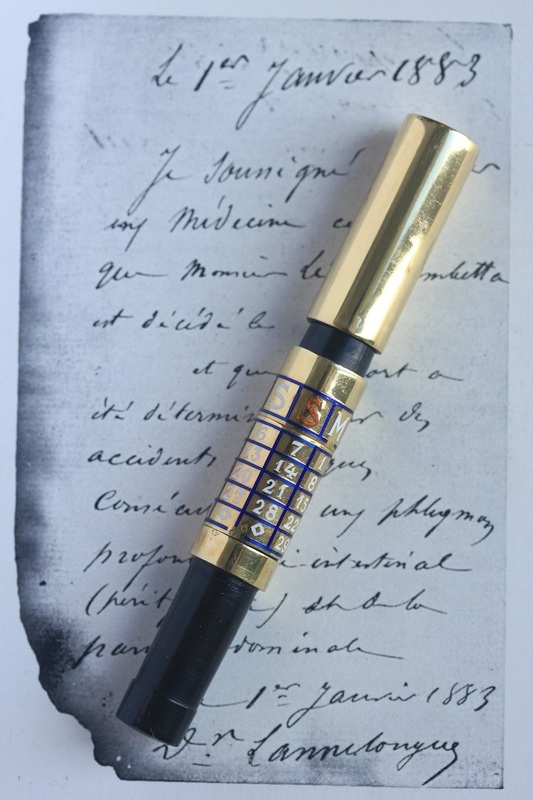 However M&C made several fountain pens with this nib made in 14ct solid gold. It is nice, smooth and flexible. The shape of the section is also interesting and is really nice with this nib. This pen has two solid gold ring on the barrel. It is a lever filler. It is engraved "Macniven & Cameron - Made in Great Britain" and "Waverley N°74. Macniven and Cameron "Self Filler"
Here is another Macniven & Cameron "Self Filler" with a different filling system. The back of the barrel can be unscrewed to see the sac with a pressure bar. You just need to press the sac and the bar to fill the pen. Simple. It is engraved "Cameron Self Filler" "Macninven & Cameron Ld" "Cameron House" "London E.C". The advertising i have found on the net shows that this pen was available with different types of nib : "J Nib" "Hindoo Nib" "Waverley nib" "Bankers nib" "Normal nib". 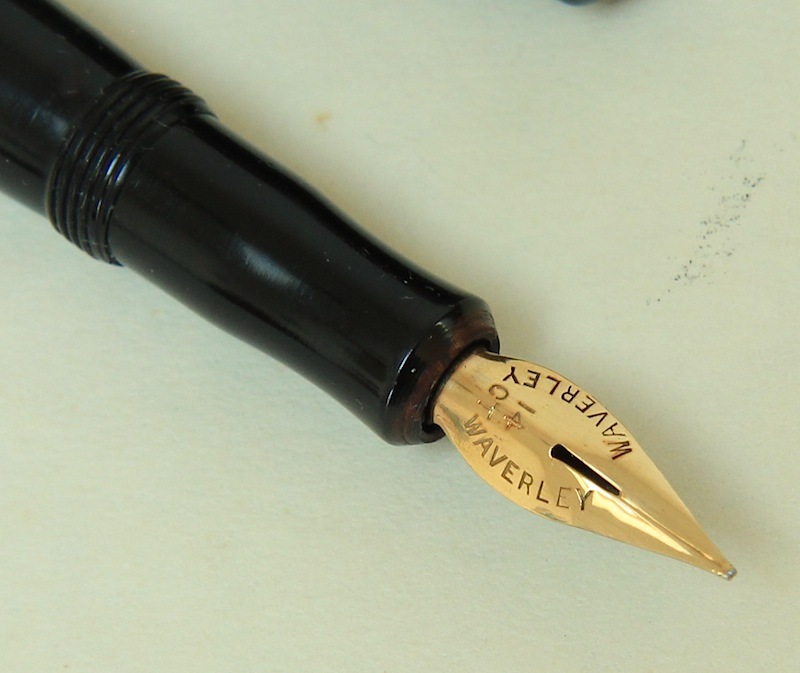 This on has the Waverley 14k nib. It is a great writer. 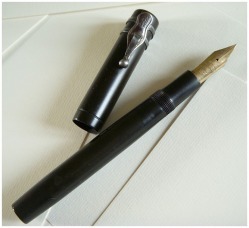 Here is another example of a vintage fountain pen and its modern edition. After several versions of the Pelikan 100 (green, blue, Toledo ...), Pelikan proposed in 2012 the Pelikan 101N Tortoise Shell. On the left, the new edition of 2012. A nice version which is really faithful to the spirit of the original one. 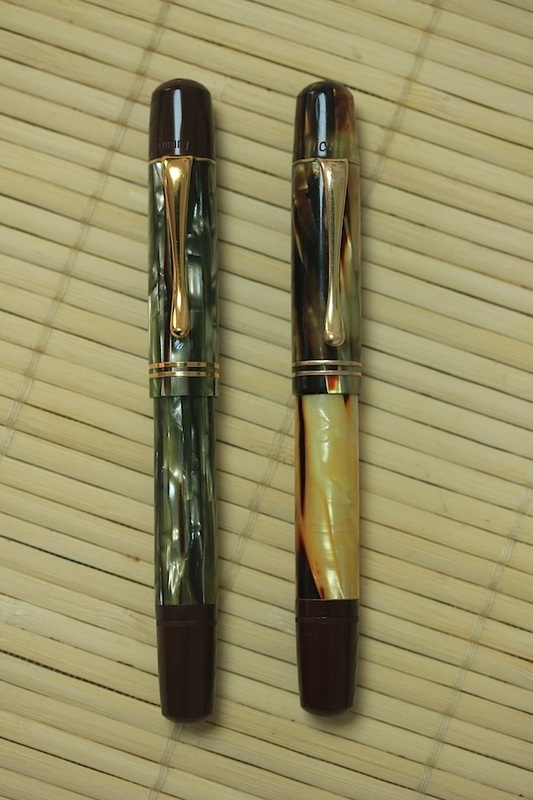 These two pens are piston fillers and have an ink window which allows to check how much ink you have left. The new version has a 14k gold nib wereas the vintage one i have has a fantastic flexible 18k gold nib. Another difference : the new version has a red top of cap. Betzler & Wilson is a company of Akron, Ohio. 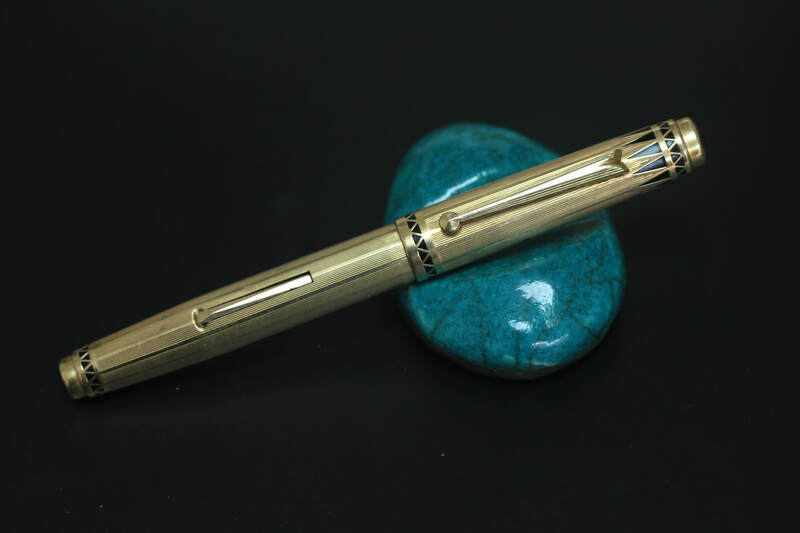 This fountain pen is an eyedropper with a high relief gold plated filigree. Very good quality. 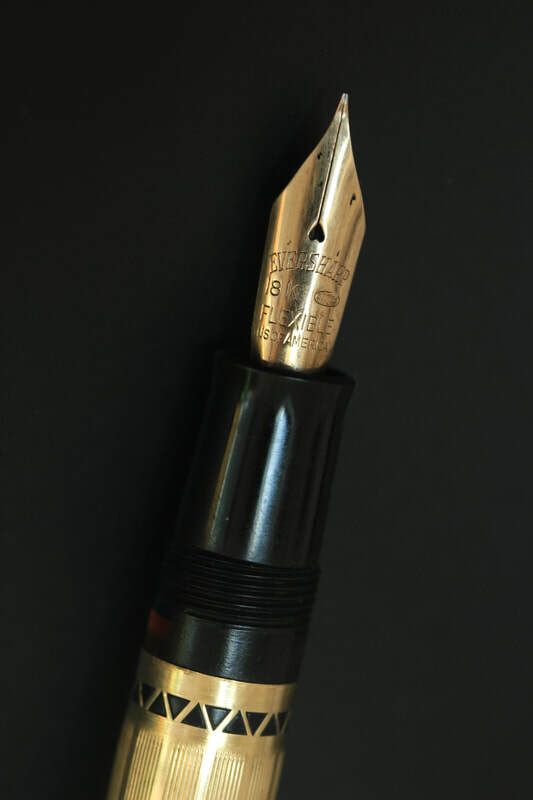 This one has a warranted 14k nib instead of the original B&W nib. This pen joined another collection. This pen is a really stunning eyedropper. Look at this fantastic overfeed which extends the entire lengh of the barrel. The principle is similar to the JG Rider below. No section. Just a feed that you pull out to fill the pen. The nib is engraved Hicks. The secret of this pen is this fantastic hard rubber overfeed. 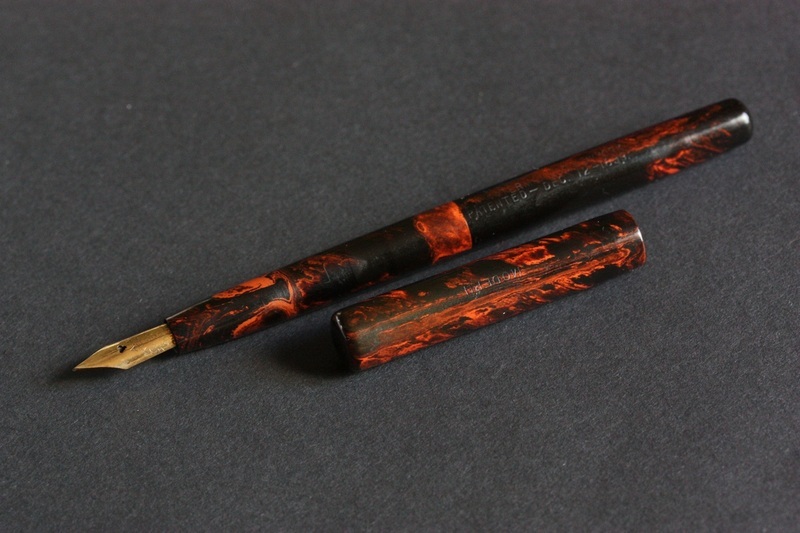 This pen is a mottled hard rubber eyedropper, taper cap, faceted, with an overfeed ... I think his name "the best" is correct for this pen. It was made for Montgomery Ward, but hard to say who was the manufacturer. This is an interesting sterling silver filigree Autofiller. The filigree is hand-cut with a flower on the cap. The mecanism is interesting : a button is attached to the extremity of the ink sac and appears at the back of the barrel. When this button is turned, the sac is twisted, the air is expelled. When the button is released, the ink is aspired. Note the specific feed with two lines. 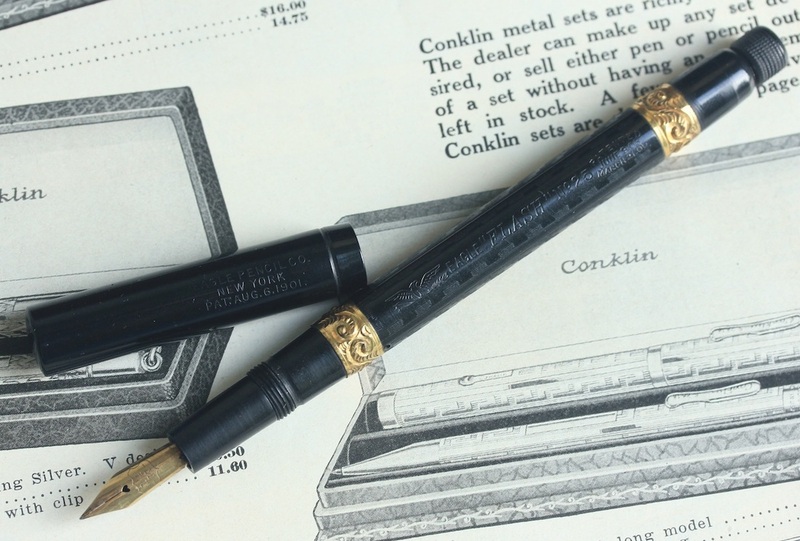 This pen is one of the first Conklin Crescent Filler. It is a straight cap and it also exists in a taper cap version. It has a very nice chasing on the barrel and two wide gold filled band. To feed the pen the hard rubber ring has to be turned, to allow the crescent to go down in the barrel. The pressure bar is fixed on the crescent and it crushes the sac to feed the pen. This is a later conklin crescent filler. This one has a gold plated filigree with a "8" design. The ring under the crescent is in black hard rubber. Other conklin filigrees come with a gold plated ring. Nice Conklin Endura in woodgrain hard rubber. Senior size, flat top. Lever filler. At this time, Parker was selling the famous Duofold, Waterman the 56 Ripple, Eversharp the "Signature", and Sheaffer, the Lifetime flat top. The nib is big and has a nice vent. Gold filled overlay. Very nicely hand engraved. Eyedropper filler. This brand is certainly on of the most interesting small brands. They made fantastic dip pens and beautiful fountain pens. 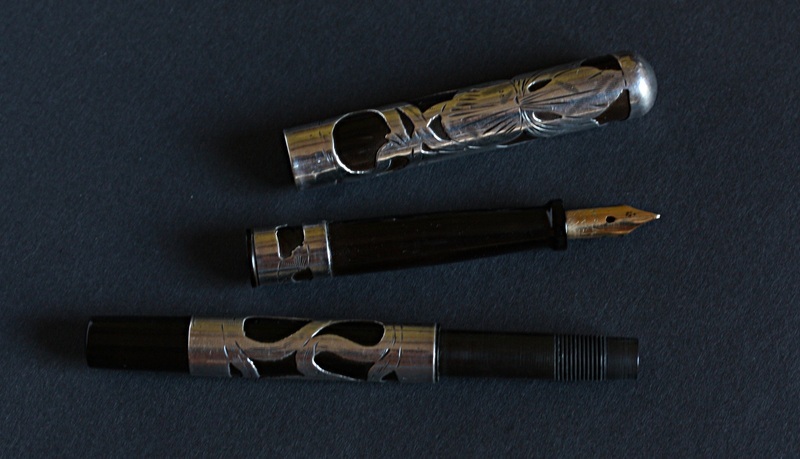 This is a nice AA Waterman in mottled hard rubber with an interesting filling system "middle joint" similar to the "Sterling" below. This is a rare Sterling midlle joint in sterling silver. Same system than the AA Waterman. 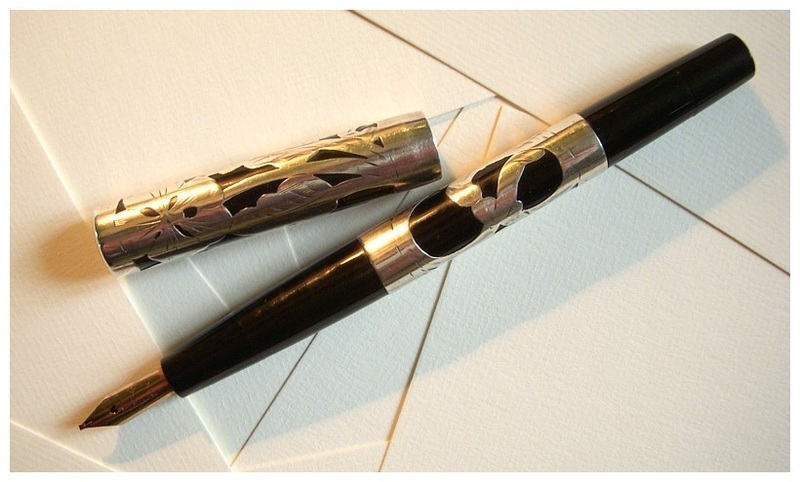 This pen combines interesting system, rarity, nice sterling silver overlay ... all what i like ! A very nice gold plated filigree This pen has a "lucky curve" feed made by Parker but it is not engraved "Parker", and it has a "Williamson" nib. 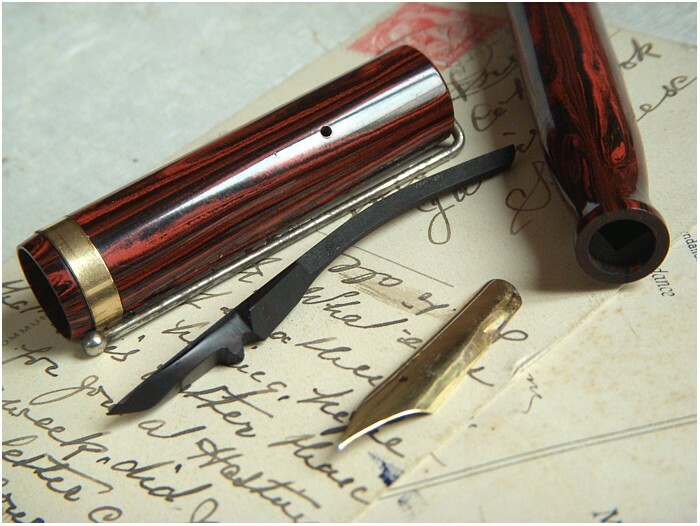 This shows as difficult it can be sometime to identify clearly an early fountain pen. Williamson, Parker or Heath ... this is a beautiful taper cap ! The mottled hard rubber one is a Century. Very nice twist design of the barrel. This pen has an under and over feed. The last one is a Wirt, made of black hard rubber and pearl. 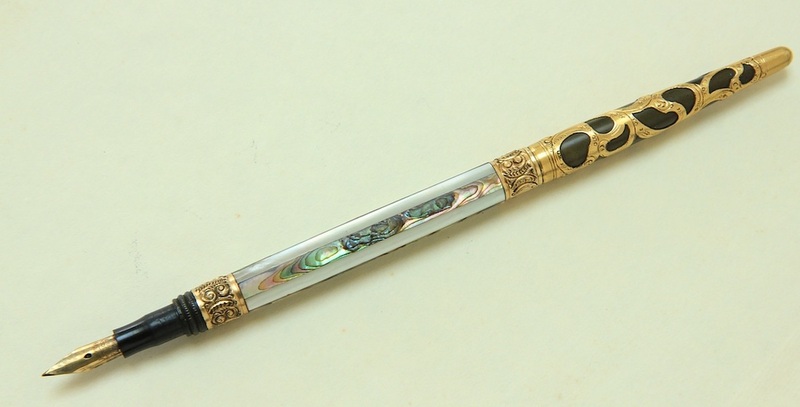 Interesting Weidlich with a diamond and snail gold plated overlay, similar to the Parker 30. 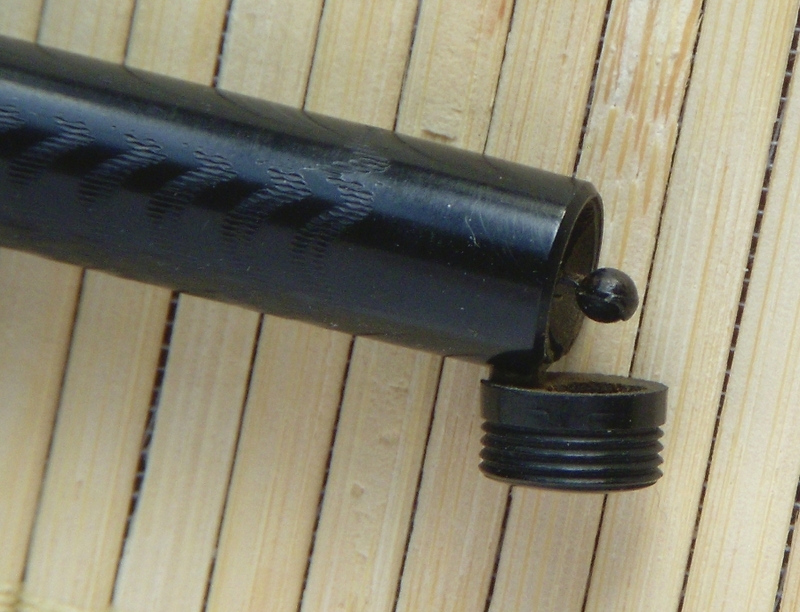 This is a matchstick-filler : there is a hard rubber rod at the top of the cap which has to be used in the hole, on the barrel, to press the pressure bar and feed the pen. 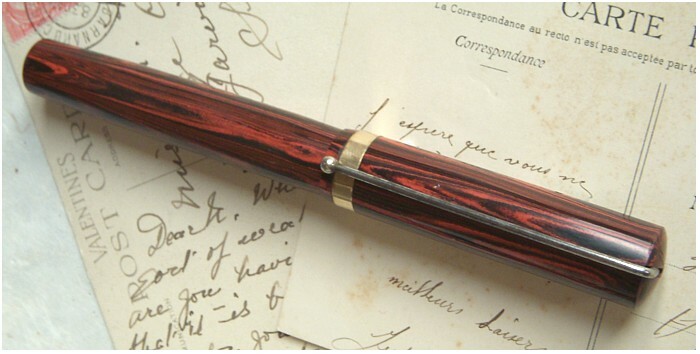 This is a nice fountain pen from the pen maker, US Fountain Pen co. The filigree is 18k gold plated, certainly made by Heath. Very nice quality. It reminds the Parker 16 filigree. This is an eyedropper filler. This pen is now in another collection. This is an Eagle Pencil Co. made in New York. It is made of black chased hard rubber with a very specific filling system and clip. 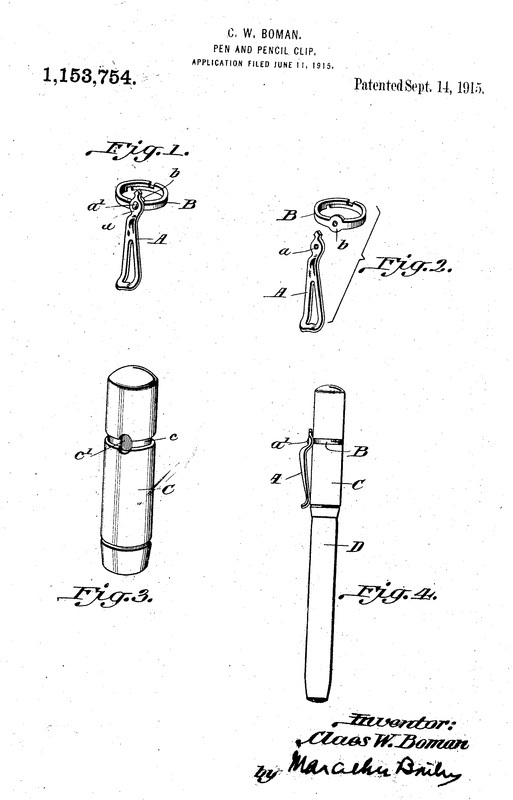 See the patent below. Not a really nice pen but an example of the creativity of the manufacturers to find new solutions. This is an interesting pen from the end of the 19th century. It comes with a glass cardridge (this one is broken at the back). Waterman used this solution later in the 20th century with no large success until the plastic cardridge. 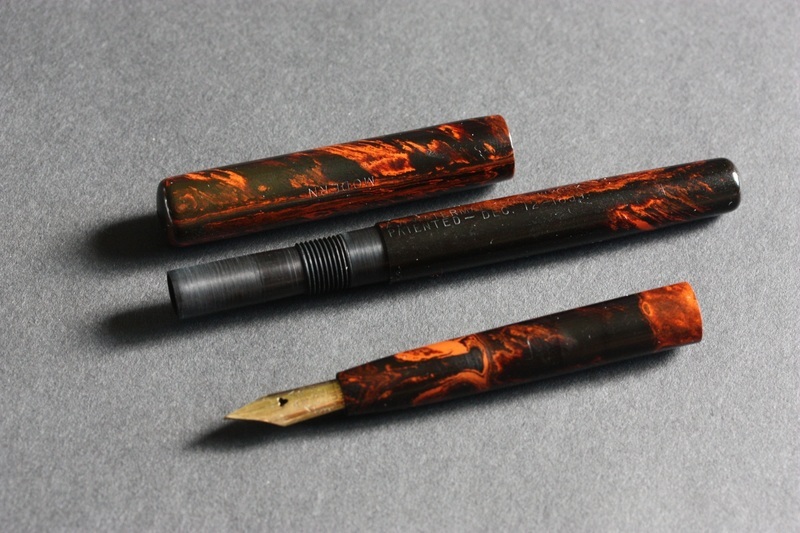 This Le Boeuf is one of the most beautiful plastic pen i have ever seen. The black and gold colors are stunning. 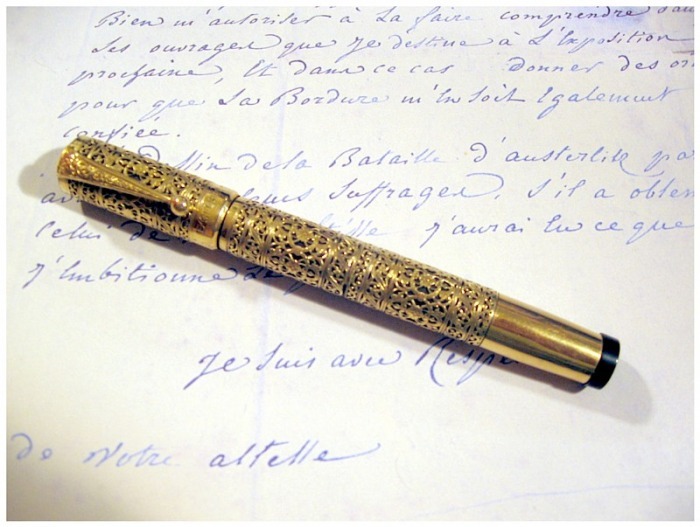 It is a large pen, oversize, streamlined, and has a large Number 8 Leboeuf nib. The filling system is also interesting as it is a kind of sleeve filler. All the barrel go down along a metalic tube. The sac is inside the tube with a pressure bar. This metalic tube also gives a good weight in hand which is not the case of other all plastic pens. 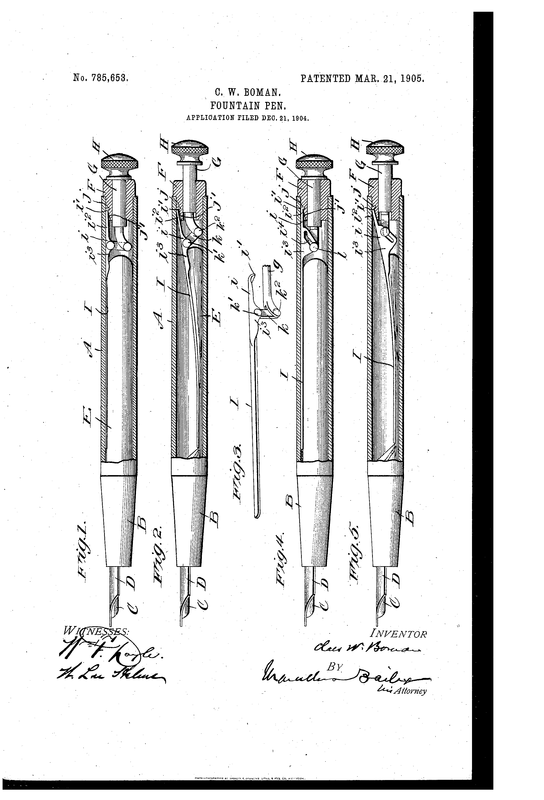 The Postal Pen was called like this as it was only sold by correspondence, which allow the company to save costs and sell the pen at a very competitive price. 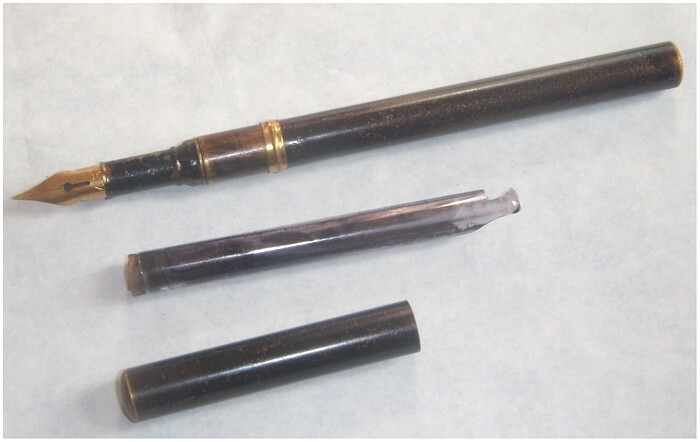 It is usually found in black color with a transparent barrel to see the ink level. This one is the "DELUXE" version. 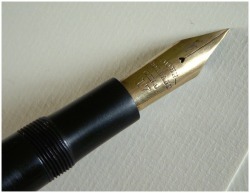 The cap and the nib are engraved "Deluxe". The material is a black and bronze plastic. Same material used by conklin for the Endura. It is also interesting to compare it with the Leboeuf which has a black and gold color. It is a long oversize pen. The filling system is also interesting. It is a bulb filler. The end of the barrel unscrew to show a sac. You just have to press directly the sac with your fingers several times to feed the pen. 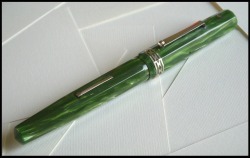 This pen is a nice exemple of the work done by the Italian jewellers on fountain pens. 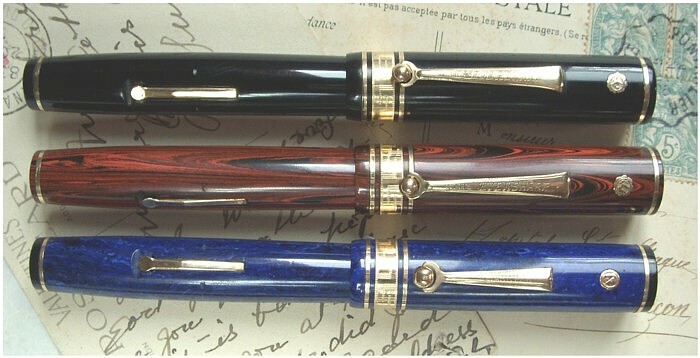 You can find a lot of different pens with a gold plated overlay usually called "continental overlay". 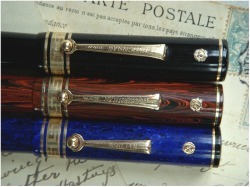 The most famous are maybe the overlays made on the Waterman 42 safety or on Montblanc pens. This one has a filigree overlay in yellow gold. This set is made in a beautiful jade green material. It is called "balance" as it is tapered on both the top of cap and the end of the barrel. This design came after the "flat top" of the 1920's. This material is very often discolored and become brown. This set has kept a beautiful color. The nib is big. The fountain pen very long and big. 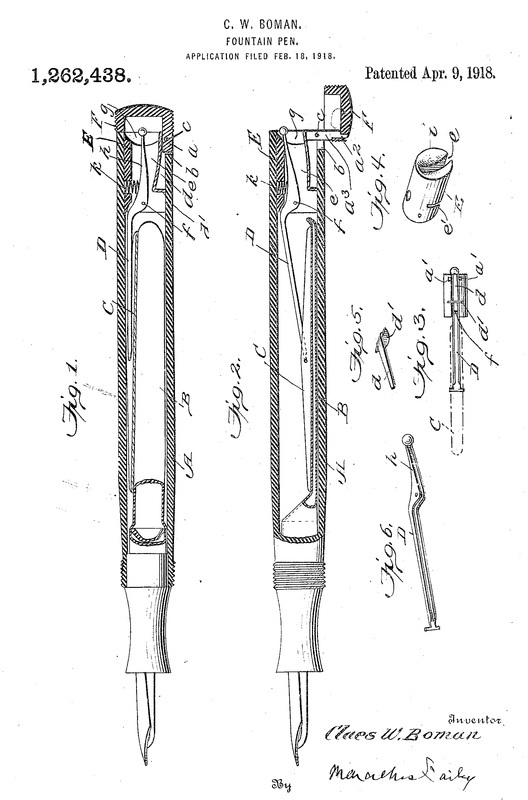 This "Pen For Men" is mainly interesting for its filling system, called "snorkel". When the button at the end of the barrel is unscrewed, a metalic tube appears under the nib. 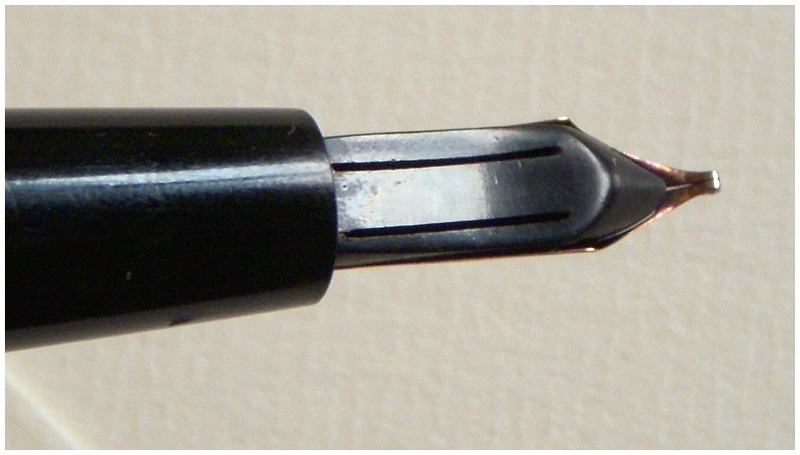 This allows to feed the pen without dirtying the nib (see picture below). This one has a rare broad nib. 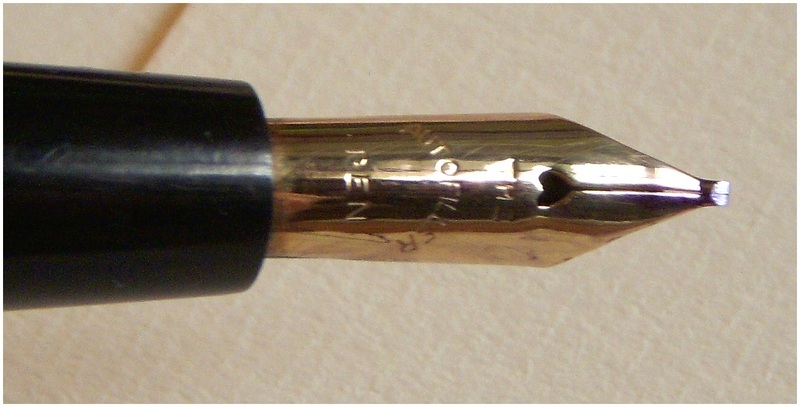 The nib is inserted in the section. To change it, the whole section has to be replaced. This is a very nice Montblanc of the 1920's. I was looking for a N°6 lever filler as i had one a long time ago that i didn't keep for i paid it a high price for the student i was. I have finaly found this one, a button filler. Note the bandless cap, the large star on the top of cap. Nice little pen. Piston filler. Exists in many different colors. The green is maybe the most easy to find. This pen is made of mottled hard rubber with gold filled clip, band and lever. This one is nicely chased on cap and barrel which seems to be very unusual. A good, solid, oversize pen. 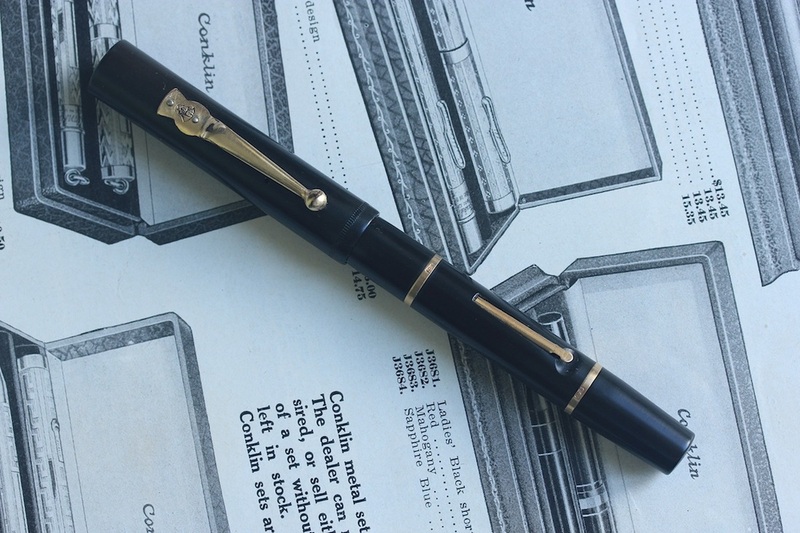 The Chilton pen company produced fountain pen only from 1924 to 1941. The Chilton pens were however very good pens, beautilful and very well made. 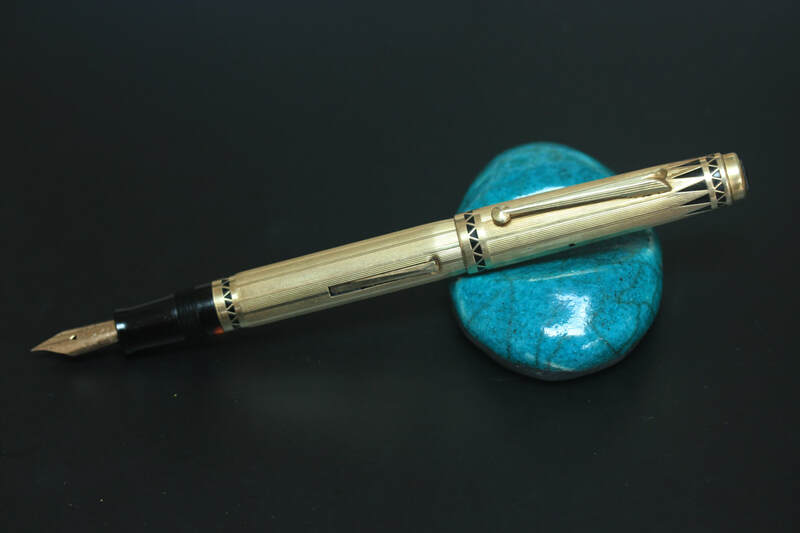 This pen is a Long Island (the company moved from Boston to Long Island in 1929) made of Turquoise celluloid. This is the same material used for the Waterman Patrician Turquoise. The system is a pump filler. 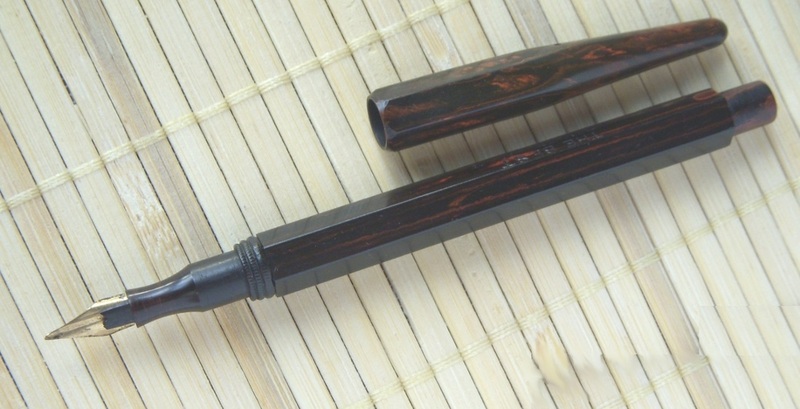 This Mabie Todd Swan is a big pen, made of black hard rubber. It is a lever filler. The nib Number 8 is huge. It is extremely flexible and has been retiped by Greg Minuskin. This Swan is made of mottled hard rubber. It is a senior size, with a number 6 nib, but a bigger size, 48, with a nib number 8, did exist. See below. This is the short version of the Swan Eternal 48. Chased hard rubber fountain pen. It comes with a metallic pocket case. 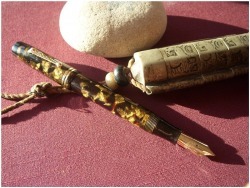 This pen is made of a nice mottled hard rubber with gold filled clip and bands. 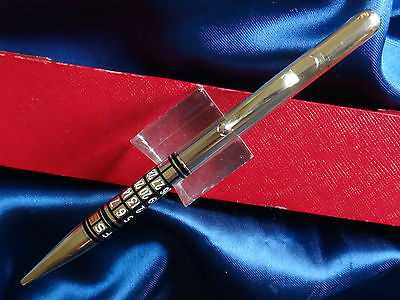 It was called Security pen because it has at the top of the cap a little tool to protect checks. Note the very short section. This pen is one of my favorite. It is an oversize pen with a big nib. I really like the design of the barrel. Note that there is no section on this pen. This pen is an eyedropper filler. To feed the pen, the feed has to be removed from the section, using the clip of the cap. Note the specific design under the feed to place the clip. 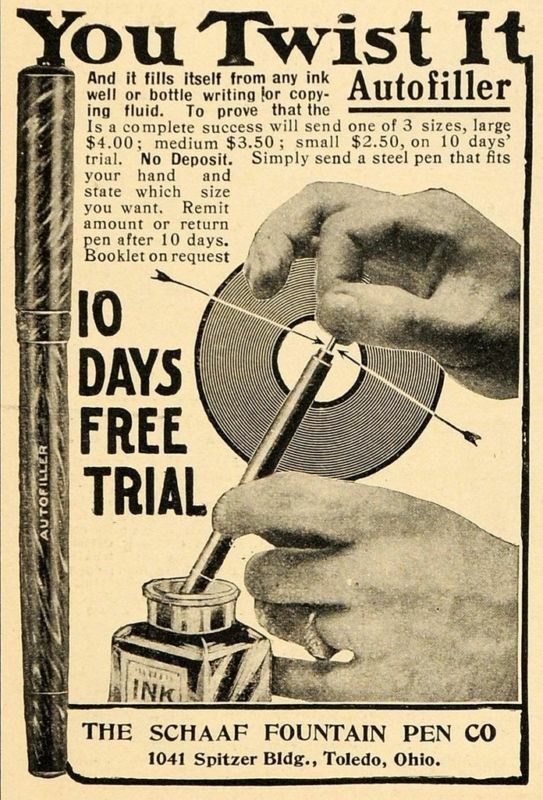 Then, the ink can be put directly in the barrel. Excellent pen produced by the "De La Rue" company. It is black chased but different colors can be found in a transparent material. The Magna is known as being a famous writer. It is very well made, solid, big. This one is a lever filler. It also exists with a "plunger filler" system,more difficult to restore. 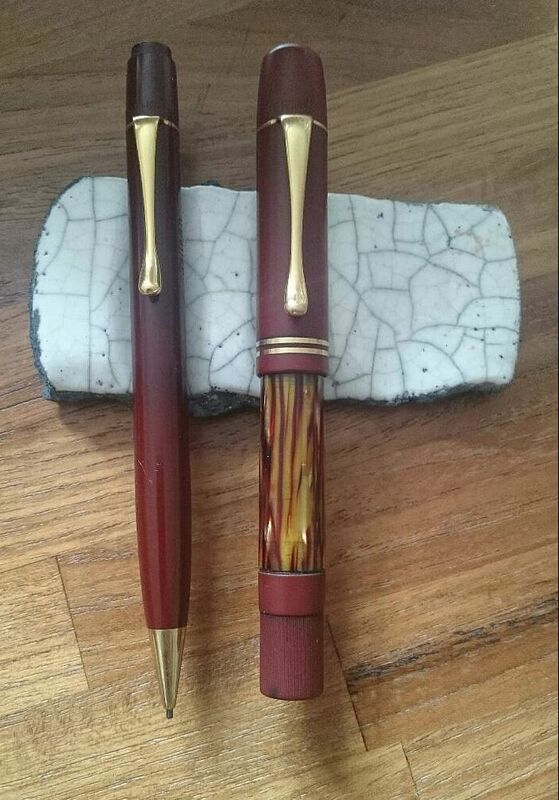 The Deco Band is a beautiful oversized pen. Lever filler. Very well made with a nice decorated band. 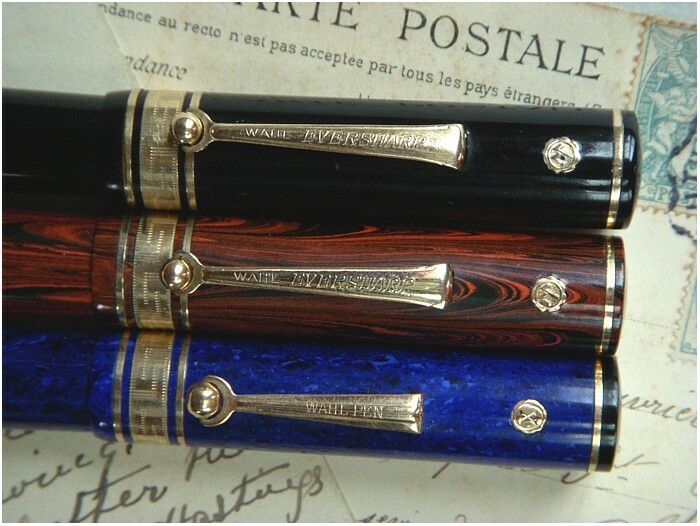 The first one is a black celluloid, the second one is "Rosewood" hard rubber, the last one is blue lapis celluloid. These three pens show two different clips. The long one is engraved "Wahl Eversharp". 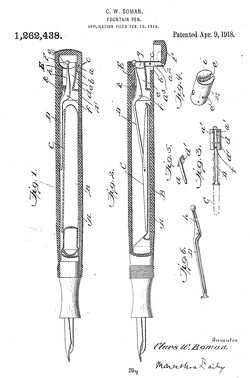 The short one is engraved "Wahl Pen". They also show three different gold seal. 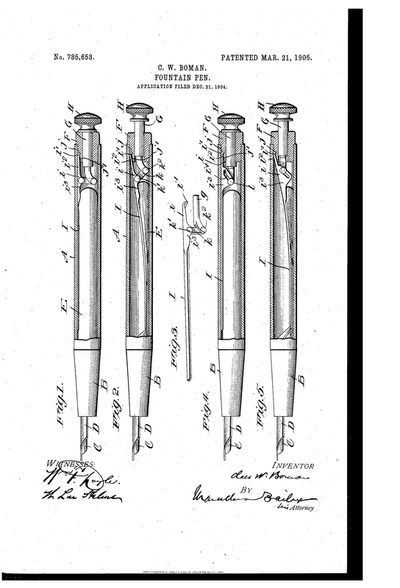 The Rosewood has the usual W. The black has the W but with a hole driled which would mean that the life garanty was not available on this pen. The last one has an "X" ... which nobody knows precisely what it means ... prototype ? late production ? No life garanty ? 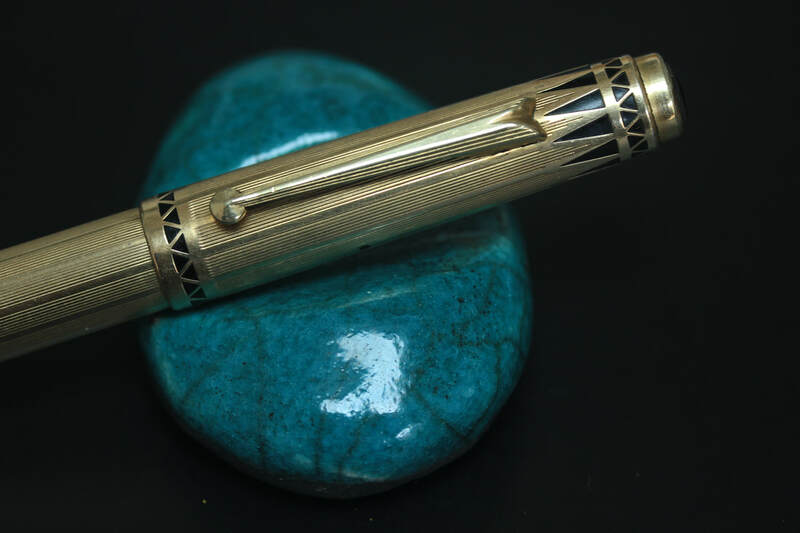 The Doric is certainly one of the most beautiful Art Deco fountain pen. The barrel and cap are faceted. The lever, clip and cap band are very art deco. 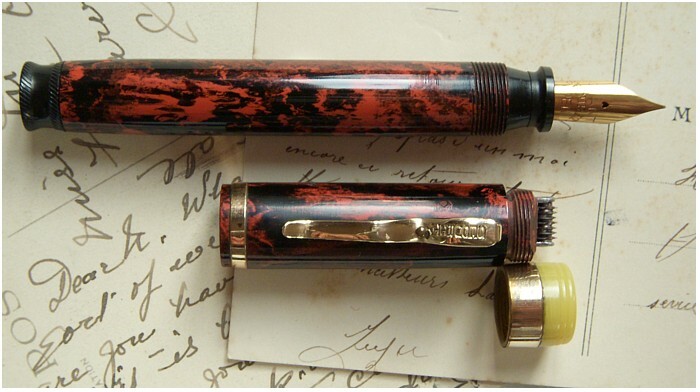 The Doric was made in beautiful celluloid. This one is a black / grey Burma in the oversize version. The nib is big and flexible. The nib exists with a system which allow to adjust the writing size, which give more interest to the pen. Same fountain than the previous one. This Oversize cathay has a fantastic color and is extremely rare in good condition. The material is very often cracked at the cap lip and / or discolored. Nib : Gold Seal "Signature"
John Holland is a famous american brand. They made some beautiful pens including plastic pens and overlays. 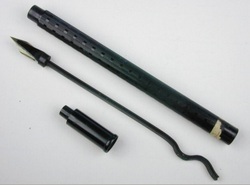 This one is an oversize eyedropper in black hard rubber. The clip is certainly a later addition as it is not signed John Holland. The pen didn't have a clip originally. The nib is a big 17, fine, flexible. Thanks to my friend Stephan M (hello Stephan !) i have discovered that the feed of this pen is very interesting. It is an "elastic feed" with a transversal cut underneath which gives more flexibility. 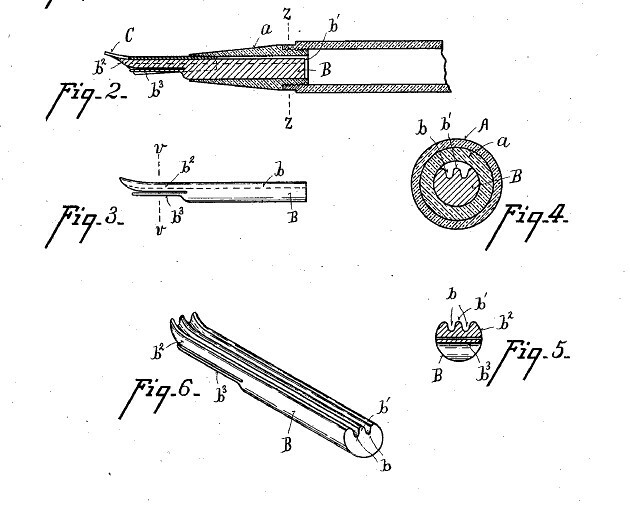 See the picture and an extract of the John Holland patent.